The patriotic Robinson family finding common ground with Oath Keepers doesn't fit the SPLC narrative of hate. 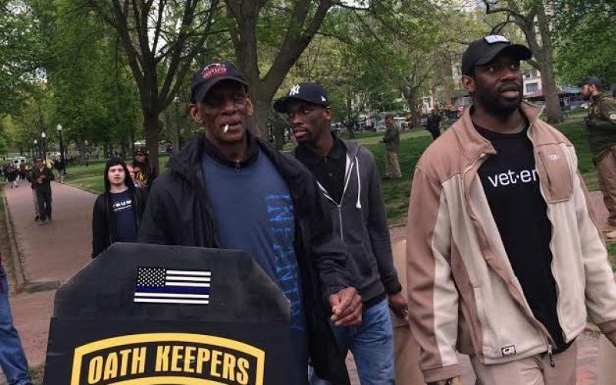 USA - -(Ammoland.com)- "Robinson blood has been spilled in every war since WWII," Nancy Oakley reported Saturday, describing some patriotic family members at Boston's Free Speech Rally who were interviewed by Oath Keepers founder Stewart Rhodes (see video below). Representatives from the group of current and retired service members, police and first responders offered a deterrent presence to threatened violence by ANTIFA agitators against citizens standing up for the First Amendment. "They tell how they feel about ANTIFA burning the American flag while flying the communist flag, and discuss what it means to be willing to 'lace up their boots' to defend this nation against all enemies, foreign and domestic," Oakley explained. "Sr. Robinson Served as an 11B in the 24th Infantry Division, and his son Charles Robinson III served as an 11B in the 1st Infantry Division (Big Red One) in Iraq. "The father's statement on how his family will ALWAYS answer the call, and how he raised his sons to be willing to die on their feet rather than live on their knees, and how they will NOT let ANTIFA destroy all their family fought for was the best speech of the day," Oakley declared. "Powerful." "It was an honor, and one of the highlights of a great day, to meet this patriot military family that has a multi-generation tradition of service to this nation," Rhodes agreed, relating the family's service records. "All that was backdrop for his powerful statement that "those &@@$! communists will not take this (pointing to the ground) from us, or all they fought for will be for nothing. "I asked father and sons to join Oath Keepers and they accepted the invite," Rhodes concluded. "And then they joined us for beers and dinner afterwards."